If you’re a parent to a teen, it’s needless to say that you have a lot on your plate as you seek to navigate those challenges that so often plague teens. The teenage years bring with them a slue of trials and tribulations, and very few parents—if any—can say that they are fully prepared to handle them. An excellent first step toward preparing yourself for the struggles that your teens might face is to educate yourself on them. Here is a brief look at some of the most common teen issues, along with some common misconceptions debunked. Substance use in teens can stem from any variety of causes, and it’s important to know as a parent that it is often not a result of “bad parenting.” Sometimes even despite your best efforts, a teen might begin to experiment with substance use as a result of peer pressure, curiosity, boredom, wanting to seem “grown-up,” or self-medication for an existing psychological condition. If your teen’s substance use develops into abuse, dependency, or addiction, then it’s highly important to seek the help of a medical professional and to consider enrolling your teen in an addiction recovery program. You can see a sample of the types of programs available to teens and young adults who are battling addiction here. An eating disorder can stem from any variety of causes. For one, as this article outlines, social media can have a major effect on how teens perceive themselves and on what standards they hold themselves to. An eating disorder may also stem from general body dissatisfaction, perfectionism, negative affect, dieting, or lack of family social support. Every case is different, and no case of an eating disorder should be taken lightly. While it is commonly perceived that an eating disorder is simply a lifestyle choice or about vanity, the truth is that individuals with eating disorders experience severe disturbances around eating, exercising, and related self-harm due to distortions in their thoughts and emotions. An eating disorder can quickly lead to several serious medical complications as well. If you suspect that your teen might be suffering from an eating disorder, you should contact his or her physician immediately and consider residential or outpatient treatment for your teen. Though commonly perceived as a suicide attempt, self-injury is typically more of a coping mechanism. A teen might cut to relieve tension, ease distress, or simply feel something at a time when psychological battles are causing them to feel numb. A teen who cuts, burns, pulls hair, or practices some other form of self-harm typically doesn’t enjoy the pain, either. Since teens who injure themselves tend to go to great lengths to hide the evidence (though sometimes it is an overt cry for help), it’s important to be highly attentive to your teen’s emotional needs and psychological stability. If you think that your teen may be practicing self-injury, be sure to work with a behavioral health specialist in order to address the underlying issues that are fueling the self-injury. Depression is a mental disorder that affects children, teens, and young adults alike. It can be especially difficult to identify in teens because it is often mistaken for teenage irritability or hormone fluctuation. It is estimated, however, that one in eight teens suffers from teenage depression. Teenage depression can stem from any variety of causes, with some cases being linked to genetics and brain chemistry, and other cases being linked to more external factors. A teen might develop feelings of worthlessness when getting low grades, feel insecure due to social pressures and perceived low social status, or be struggling with conflicts in family life. Stress is often a major trigger, and relationship issues can be a factor as well. 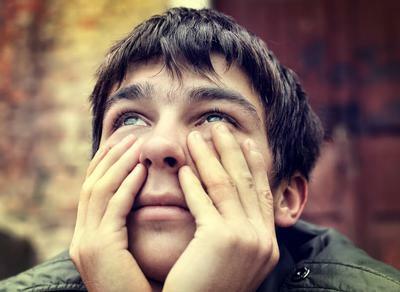 If you notice unusual behaviors in your teen, such as anxiety, excessive sleeping, frequent headaches, irresponsible behavior, a sudden drop in grades, loss of interest in eating, withdrawal from friends, or disinterest in once-preferred activities, it could mean that your teen is suffering from teenage depression. When in doubt, be sure to contact your physician about your teen’s psychological health.